A few years back I was introduced to JUSTIN Cabernet Sauvignon by friends and neighbors. It is a dry and powerful wine that sells very well for us in the store. Usually priced in the $20.00 range it is one I recommend often to customers looking for this type of Cab. With a price range of $60-$75.00 Justin’s the ISOSCELES was often on my radar or I should say on my wish list. Not an everyday drinker for me but a special occasion wine who’s cork was recently popped. Justin Vineyards and Winery is located in Paso Robles appellation of California’s Central Coast. Per their website the “appellation encompasses more than 600,000 acres and is the largest stand alone AVA in California.” Impressive news to me a big fan of wines from this region. “The region’s first grapes were planted in 1779 by Franciscan missionaries and today are home to the third highest concentration of wineries in the United States.” When owner Justin Baldwin began with 160 acres in 1981 only 10 wineries existed in the area. Fast forward to 2013 and being recently named one of the best 75 wineries to visit by FOOD & WINE. The winemakers refer to ISOSCELES as a “left bank” Bordeaux style wine. The 2009 vintage, now mostly sold out, was an unfiltered blend of; 94% Cabernet Sauvignon, 3% Cabernet Franc and 3% Merlot. The 2009 growing season began early due to a very warm spring. An early April frost affected parts of Paso Robles, but we were relatively unaffected. Consistently warm summer weather segued into a moderate early fall with some rain, but the vines shrugged off the water retaining great fruit concentration and flavor. Balanced weather through the fall allowed us to pick by flavor profiles without any concerns about excessive temperatures and as a result, our red wines from this vintage show incredible density and power of varietal expression. The style of the 2009 vintage is flashy and intense. Maturation was over a period of 24 months in 225L French oak barrels (Bertrange, Allier, Center of France); 64% new barrels. The bottling period was Dec. 12-21, 2011 with a release date of May 1, 2012. My first observations were as follows: no alcohol on the nose, but plenty of earthiness, dark fruit sweetness [noted as ripeness] and oak. Along with glass tinting slow legs which surprised me because of the noted lack of alcohol on the nose. Alcohol reportedly at 15.5% by volume. On the palate a dark fruit forward blast on the first sip which softened in minutes. Medium body with mid-level yet mouth covering tannins. At the one hour mark I noted better defined new wood on the nose, clove/licorice and fig. Pepper, vanilla/spices and dark fruit [raisin/prune] on the palate. I can see why Wine Spectator rated the 2009 ISOSCELES 93 points. This is what I would refer to as one Easy Drinker! Next on my Justin wish list? The 2010 ISOSCELES for comparison and Justin’s JUSTIFICATION, just because. ¡SALUD! 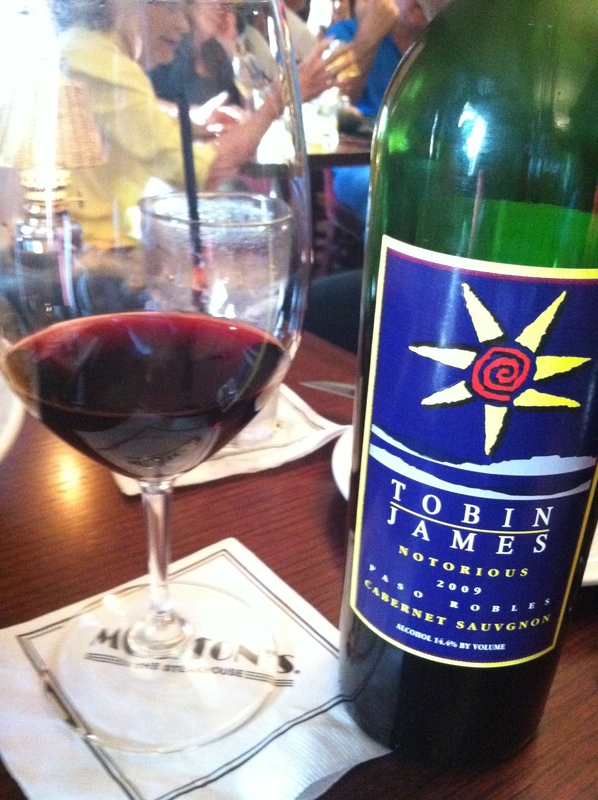 93 Points Wine Spectator: “Offers a tight, generous mix of raspberry, wild berry and pomegranate. This is pure and focused, gaining depth and velocity, ending with a long, persistent finish.” Drink now through 2022.” 9,000 cases made. Appearance: Dark ruby in the glass with a violet rim. Aroma: An alluring, rich mix of ripe black currants and berries faceted with vanilla, cinnamon and cocoa highlights. Palate: Full bodied, complex black fruit of lush currants, and cherry layered with licorice and vanilla spice with chocolate, roasted coffee, and tobacco. The finish is extremely long and complex, showing firm plush tannins that bring everything together making it easy to drink it now, but implying a great future. Below is a chart and/or link to a chart that shows Justin wines by production. I was impressed to find this on their website. We discovered this wine about 8 years ago while visiting the beautiful Biltmore Estate in Asheville North Carolina and their vineyard. More importantly their tasting room! Although wines were plentiful, for some reason this one in particular stuck out. As we returned with other visiting guests to our Tryon NC home over the years we were repeatedly drawn to this one blend as we ordered cases to take home or had friends buy bottles for us as they visited. For years this particular blend was only available at the Estate itself. A few years ago on-line ordering was expanded to include our other home state of Florida which made ordering easy but the shipping costs not pretty. Originally priced in the $16.00 range shipping would put it in the mid-low $20’s range. Not exactly a deal for what we considered a very good every day wine. Flash forward, while visiting our home in North Carolina, I walk into a Fresh Market and what do I see but BILTMORE Century Red Wine for $9.99!!! My next automatic step was to call friends down south to see how many bottles I should drive back upon my return. Let’s just say a dent in the inventory was made. At $16.00 this wine is good at $9.99 this wine is GREAT. A few years ago as my hankering for wine knowledge expanded I decided to research this wine to see why I was attracted to it. As it turns out this blend includes Sangiovese [one of my favorites varietals] and Merlot a varietal I am appreciating more so every day. Although I have seen this wine priced in the $9-11.00 range at local grocery stores it is still $15.99 on the website with possible discounts for quantity purchases. If you can find it, give it a try! SALUD! My notes: A Sangiovese/Merlot blend, light to medium in body, dark in color, robust [I think of it as a controlled fruit bomb], pepper, tobacco on the nose with the taste and acidity of strawberry and dark plum as it opens. I recommend decanting for about 30 min.